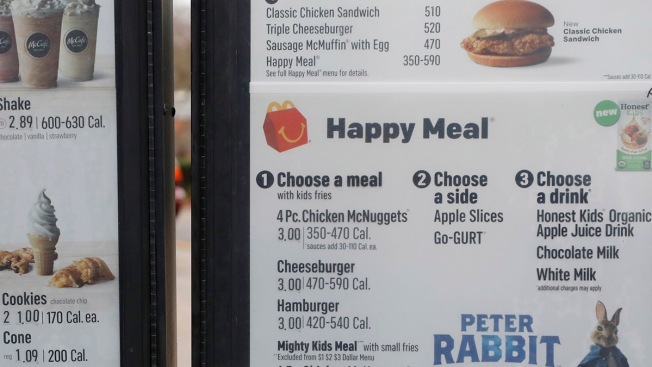 FILE - A McDonald's drive thru menu shows calorie counts for different items, in Ridgeland, Miss., on Feb. 14, 2018. After years of delays, the U.S. Food and Drug Administration (FDA) has introduced a law requiring restaurants and other food outlets with 20 or more locations to post calorie counts. In anticipation of the law, big firms like McDonald's and Starbucks have already introduced the calorie information on their menus and menu boards. For example, a Big Mac Meal at McDonald's with regular fries and a full-sugar coke contains 1,120 calories, and that information is now posted clearly in the chain's restaurant locations. According to the 2015-2020 Dietary Guidelines for Americans, women are likely to need between 1,600 and 2,400 calories a day, and men from 2,000 to 3,000. The food labeling rule had an original compliance date of 2015, but that was extended three times to help the industry understand and prepare for the rules.